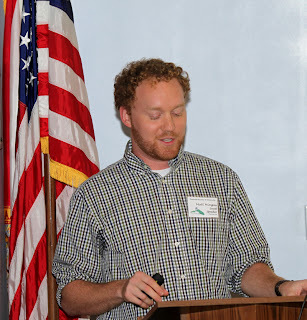 University of Florida graduate student Matt Mingus gave a somewhat chilling lesson in American history when he spoke at the January 11 meeting of the Gainesville Humanist Society. The fight for religion-free schools is not a relatively new phenomenon, but was raging even in the mid-19th Century. Matt pointed out that after the Civil War, more and more immigrants streamed into our country and became good loyal citizens. Because they brought a diversity of religious beliefs, school systems could no longer accommodate the dominant Christian protestant religion in the school curriculum and activities. Fundamentalist sects reacted strongly. When the Cincinnati public schools decided in 1869 to ban Bibles, prayer and hymns from its schools, fundamentalists took their case all the way to the state supreme court. There the school board's lawyer, JB Stallo, argued that government could only support religion by guarding the "freedom" of its development, and that anything more would be "tyranny and oppression." Stallo argued that the US "at least ought to be, not a Christian, but a free people." The school district won the case and the secularization of schools continued, ensuring that science and history be taught by empirical methods and objective facts, and not through the distorted and limiting view of religious dogma. As today's fundamentalists wage their battle to "take back" the schools, proponents of secular education continue to face the challenge of fending off new and well-financed attacks. "The price of freedom," Matt reminded to audience, "is eternal vigilance." Matt's presentation, aptly called "Not a Christian, but a Free People," grew out of his essay, "Rejecting 'His Story.'" The essay won second place in a national contest sponsored by the Freedom from Religion Foundation. In the essay, Matt discusses the current efforts of the religious right to rewrite history in order to make the US a "Christian nation." Matt is currently working on his PhD in European History, and teaches undergrads at UF.